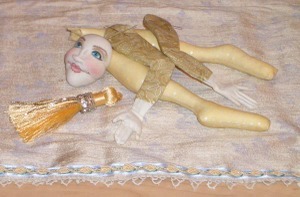 Here's the face, the legs, unstuffed arms (the fingers have their wires in them) and part of the skirt .. hand-stamped dupioni silk. Will show more in the next day or two. Just let me say that it was a blast!